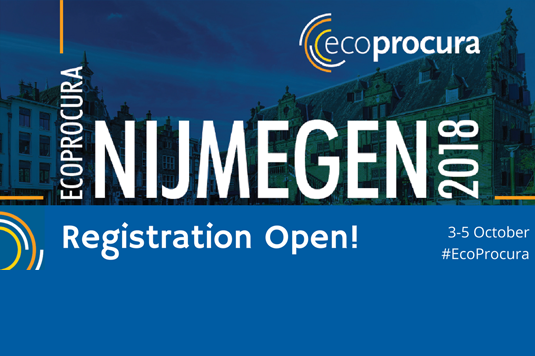 Registration is now open for the EcoProcura 2018 conference on sustainable, circular, and innovation procurement, taking place from 3 – 5 October 2018 in Nijmegen, the Netherlands. EcoProcura 2018, marking the 20th year of the conference series, will bring together over 400 procurers, policy makers, businesses, researchers and international organisations. The conference is organised by ICLEI and the 2018 European Green Capital, the City of Nijmegen. As a strategic partner to ICLEI’s Procura+ Network, the CSCP invites you to join the 2018EcoProcura Conference! The interactive programme of the conference will present, discuss and identify ways of using procurement as an effective tool in the strategic decision making process of a public authority. It will focus on important policy areas for sustainable, innovative and circular future, such as sustainable mobility, renewable energy and low carbon infrastructure. Approaches to organisational culture and behaviour change to achieve sustainable, innovation and circular procurement will also be explored. In addition, participants will have the chance to learn more about topics such as, life-cycle costing, design of specifications and monitoring of contracts. Call for Contributions closes on 18 May 2018. Registration required and conference fee required for attendence. Please visit the Conference Website for detailed information on the programme, confirmed speakers, the Call for Contributions, as well as the registration form. Find further information on the CSCP’s strategic partnership in the Procura+ Network here. Please contact Janpeter Beckmann for further information.